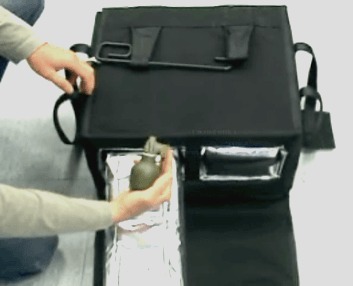 This explosive transport case for explosives, detonators, det cord, offensive and defensive grenades is made by SEMA World and is known by the acronym ETE. If you have to transport explosives or unexploded ordnance in a way other than the back of a pickup truck with plywood and sandbags, the ETE may be your best solution. The product is designed in different sizes from 1 to 12 pockets. Your case price will be determined by how many drawers and how many total pockets. The price above is for the 2 Drawer, 4 Pocket. In case of one of the items in a pocket blows up, there is no initiation with the other explosives or ordnance items. Blast and fragmentation will be absorbed and no damage inside car, truck, boat, helicopter or plane will occur. This equipment is used by military and police Special Forces throughout Europe and is now available in the US and for commands overseas. Cases are usually delivered in 5-7 weeks.